This section of the site shows a series of players in various weight divisions and from different countries who won medals at the 2004 Athens Olympic Games. 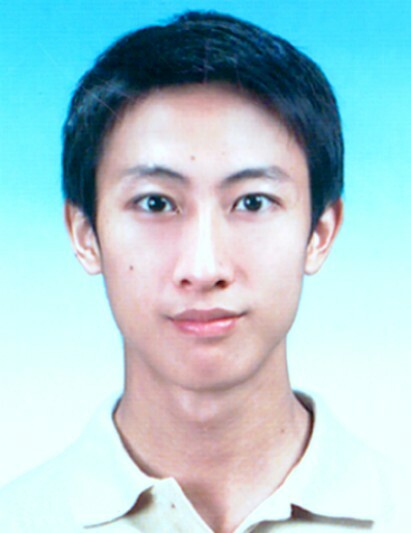 Height: 1.73 m / 5'8"
Chu Mu Yen is one of the most talented Taekwondo players around. At such a young age and with countless major championship medals under his belt he is seen as one of the top five players in Fin weight in the World and now of course one of the top five Fly weight players in the World. Amazingly he won his first World Championships Gold medal in the Fly weight catagory destroying all opposition. Many were eager to see how he performed in the 2004 Athens Olympic Games as he secured his place by winning Gold in the World Qualifiers. He seemed to be plagued by bad luck prior to 2002, in the sense that every time he got to a final in Fin weight he lost to a stronger player and as his record shows he has only won one Fin weight Gold in 2001. With the 2003 Universiade, 2003 World Taekwondo Championships and the 2004 Olympic Games Gold medals around his neck he has proved to be one of the most successful flyweights of our time, with plenty more to come in the future! Height: 1.75 m / 5'9"
Brother to the famous Iridia Salazar Blanco and despite his medal count, until he won a silver at the 2004 Olympic Games, Oscar was never regarded as a well known player. 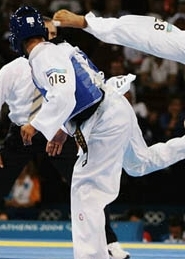 He has been competing since 1996 when he won his first gold medal at the Pan American Taekwondo Championships. At the age of 26 he still has a couple of years left on the competition circuit and with an Olympic silver medal around his neck who knows what he will be aiming for at the 2005 World Championships. Oscar is unique in that he changes weight quite frequently, moving in between Fly and Bantam weight. His preparation for the Olympics couldnt have been better as he was seen competing around the countless World Opens for months. He definetely still has some more medals to win yet! He is fast, cocky with a 'ki-hap' to die for! Tamer Bayoumi (or Salah as he is also called) is not such a new player as many would think. He won his first medal at the age of 18 when he won a bronze at the 2000 World Cup in Lyon, France. He used to compete in Fin weight but has since moved up to Fly weight quite recently. He has been very unlucky in some of his previous results as he tends to draw his matches quite a lot. However he is a player who either has an 'off day' or a 'great day' with no in between! The Olympics proved that he was on his his game on that given day. Lets hope he has a 'great day' at the World Championships in Madrid next year! Height: 1.66 m / 5'5"
Chen is a formidable opponent who posses as a great contender in the -49 Olympic Fly catagory forthe Olympic Gold. Although she doesnt hold many titles, her play of late has been astounding. 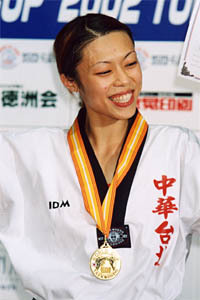 She has never won a world title but with 2 World Cup wins in 2001 and 2002 she was regarded as a heavy favourite for Olympic medals. Her match against Brigida Yague in the recent Dutch Open was astounding. Her play throughout the Olympic Games was astounding with a gold medal win against Cuba's Labrada Diaz. All Chen needs now is the the World title in Madrid next year to be considered as an all time great. 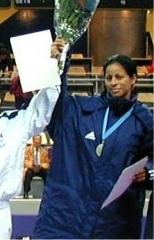 Height: 1.67 m / 5'6"
Height: 1.59 m / 5'3"
Yaowapa Boorapolchai only began her major international career in 2003. She has done excellent considering her age with 4 Bronze's and 1 Gold all in the space of 2 years. She is a very steady player who gets the results when she needs to. Although her lack of experience means she has not yet collected any major wins from her exploits, she still needs time to prove herself. Her bronze medal match with Gladys Alicia Mora Romero of Venezuala was not quite what everyone expected as it was quite boring and slow. However in her earlier matches she proved her worth by beating the Gold medal favourite Brigida Yague in the first round! At the age of only 20 years old she has done more than enough to prove that she has the potential to win major medals. Definitely one for the future and possibly another medal for her in Madrid next year.